A quick Uzbekistan guide for intrepid adventurers, from Samarkand to Khiva, by Devika Misra, and more from Smart Travel Asia and Dancing Wolf Media. 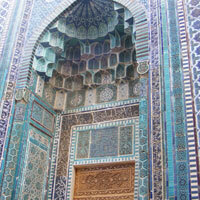 There is much adventure to be had in Uzbekistan, but first you’ll need to get your visa. Bring a good camera for those stunning blue domes. IF YOU, like me, regard Hong Kong’s or Singapore’s efficiency and infrastructure as the norm, Uzbekistan may not quite be your kind of place. If you expect your hotel will have air-conditioning, running hot and cold water and the internet…it will…but not necessarily all at the same time. 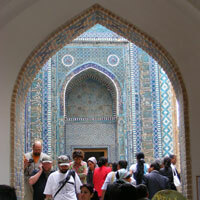 You realise that a visit to Uzbekistan may not be for the faint hearted as soon as you try and get your visa. In Singapore, at the dingy small consulate in a crumbling building off Kramat lane, the emphasis is in the “trying”. First, you need to make sure to call beforehand for an appointment with the apparently sole consular staffer rather than just dropping in during regular working hours. This, only to discover that the consulate does not carry its own visa application forms in hard copy. Nor will it be easy to download the application form off the Web. The tall, handsome consular officer agreed with me that perhaps the best way to obtain a visa application form to Uzbekistan was to first fly to Tashkent, collect one, and then return to the consulate to apply. However, if such small bureaucratic hurdles don’t put you off and you are not a vegetarian, this ex-Soviet republic is certainly well worth a visit. You can’t fly directly from Singapore – and from many other cities, too numerous to mention – so it’s worth looking into options via both Delhi and Kuala Lumpur. But don’t make any quick assumptions about air travel in Uzbekistan. While my international Uzbek Air aircraft from Delhi to Tashkent looked like it should be held together with some strong rope, the plane from the tiny old town of Khiva to the famed silk route market town of Bukhara, was in pristine condition. While at Tashkent airport you are left to guess which carousel your bags may arrive at, Bukhara boasts a spanking new airport of international standards. 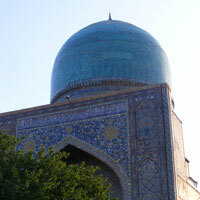 Tashkent, with its wide boulevards is reminiscent of a quiet European capital of yesteryear. Arriving from South Asia on a weekday afternoon we wondered where the people were. My friends and I were keen to leave Tashkent as quickly as possible in search of the “real sights” of Uzbekistan…Samarkand and Bukhara-the famed market towns of the ancient silk route where traders exchanged their exotica – spices, carpets, gold. But we were advised to also visit sights off the beaten track like the northwestern town of Nukus for example, which boasts a unique and prolific collection of Russian art in the desolate and rural province of Karakalpakstan. Centuries ago, majestic fortresses and fire temples adorned its bleak landscape. Karakalpakstan was the seat of power for the ancient Khorezm dynasty of the third and fourth centuries BC. The kingdom practiced Zoroastrianism, and since my group was traveling with a Parsi friend, we felt obliged to take his heritage seriously. Against the better advice of his wife (the only resident of Uzbekistan in our group), the rest of us trudged up all the way to what was once the rampart of the old fort. We had understood we were in the desert and were quite prepared for a sand storm – in fact we were hoping for one. Instead what we got was a sudden and heavy downpour of rain. We foolishly waited at the top of the muddy mountain for the rain to abate only to discover, 45 minutes later that the mud was far too slippery to descend. With no vegetation to provide any sort of grip, the baked earth quickly turned to the kind of complete slush that one can only slide down. Since nobody was willing to take the risk of broken bones, it seemed like we may have to spend the night up there. Eventually our driver had to come to the rescue. Far more sure footed than us, he trudged half way up the hill in his socks, and shovelled a dry path down for us. We opted out of all further ancient ruins after that and drove straight onto the ancient town of Khiva. Legend has it that the town got its name from the sound of the sigh of relief ancient travellers made (“k-heave-ha”) when they stopped to drink the sweet refreshing waters from its well. One of these ancient travellers is supposed to have been none other than the biblical Noah. Though there was nothing biblical in the least about the hotel we stayed at, the travel agent said he could not get the preferred choices – Asia Khiva or Malika Khiva – as we had booked “only” two months in advance and not the advised three or four. 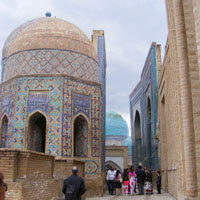 It was from Khiva that our visual feast began, and it continued unabated to Samarkand. Azure tiled domes, arches and steps of blue gazed tiles in niches within the dome, imposing sombre minarets, baked mud walls, gilt carving and inlay inside tombs and mosques and the many madrasas kept us spellbound for most of the week. Naturally, the sightseeing was regularly interrupted by bouts of shopping: we were, after all, a group of five women and one man. Carpets of wool, silk and cotton, embroidered tapestry, caps made of fox hair, calligraphic art and glazed ceramics are all yours for the taking in both Bukhara and Samarkand. I settled for a lamb’s wool cap for my father and some delicious dry fruit in Bukhara. That, it turns out was the only delicious edible in Bukhara, a town not known for its food despite a couple of new ventures having sprung up recently. In terms of diet it helped to be a hearty meat and bread eater while my vegetarian friend had to survive on a salad of sliced tomatoes and onions! Just as she was about to pass out from starvation, we realised that Samarkand had a couple of Western style eateries and we were pleased with our pizzas and salads in the well-known Venezia, and also enjoyed the popular tourist restaurant Plataan. The rest of us settled for chunks of local bread, hunks of meat and local delicacies called manti's (rather like large steamed dim sum) and samas – fried dumplings – a version of the Indian samosa. You would of course expect Bukhara to be more of a shopper’s paradise than a gourmet’s, given its history on the iconic Silk route. Today the town’s archaeological digs clearly mark out many of the old caravan serai’s where ancient travellers and their horses and camels rested for a night or two. Our “caravan serai” (Sasha and Son. No.3 Eshoni Pir Street, tel: [99-865] 224-4966.) was a traditional house in the heart of the main square that has been well restored and refurnished. Despite being greeted by a couple of cockroaches in the bathroom and open courtyard it was comfortable and clean. The hotel in Samarkand (Samarkand Plaza, Dagbitskaya-Rudaki Street, tel: [99-866] 232-4099) where we spent two nights is more modern, but many of its rooms have air-conditioners that don’t work. The hotel staff politely informed us that they didn’t have internet “because it’s the beginning of the month.” But who needs the Web when the hotel boasts beautiful gardens and a great breakfast buffet complete with chocolate biscuits. 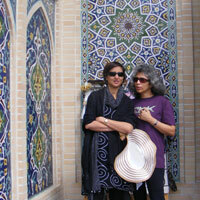 In the end we agreed that it was the country’s diversity that we had enjoyed the most-. Its people are ethnically Russian, Uzbek, Turkish and Mongol. While Uzbekistan is predominantly Islamic, there is a clearly visible orthodox influence and many references to Zoroastrian practices. The best times to visit are during the “high” season March to May and then again September through October. From June to August the temperatures tend to skyrocket and it can be scalding hot. Neither clearly Soviet nor Turkish, this gem of Central Asia may lack the vast natural resources of neighbouring Kazakhstan, which has both oil and gas. But it boasts beautifully restored historic monuments, cheerful people and meals that cost about US$6 per head…at least for now.